The Snowball cocktail takes advantage of anise liqueurs' tendency to cloud up, and the Roman Snowball counts on sambuca's bright white color when it is diluted with water. It's a very pretty drink and super tasty if you like anise liqueur. Compared to absinthe, sambuca is pretty sweet, like a dessert liqueur. The trick to getting the look right is to use crushed ice. Fill a champagne flute with crushed ice and use more crushed ice to shake the sambuca. Then strain it in. 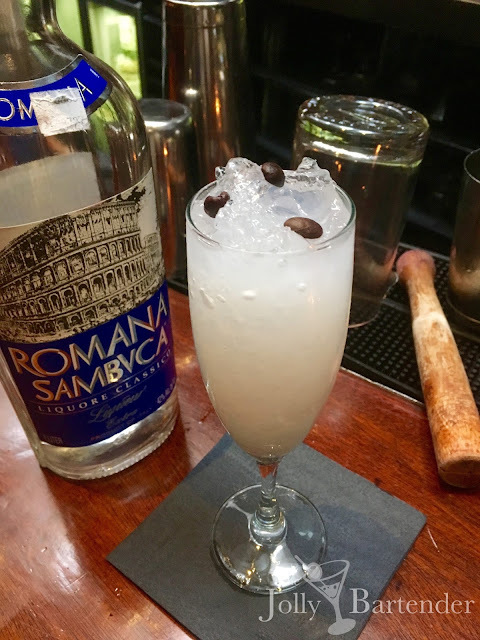 The five espresso beans are some kind of New York thing, and you are supposed to eat them after they soak in the sambuca a while, according to the New York Bartender's Guide. Shake sambuca in a shaker full of crushed ice and strain into a champagne flute full of more crushed ice. Garnish with espresso beans.